Moy, Fincher, Chipps Dermatology & Facial Plastics is one of the national leaders in Mohs Micrographic Surgery. All of our exceptional cosmetic surgeons are fellowship trained and recognized by the American College of Mohs Surgery. This distinction is unique and is awarded through an extremely competitive review and selection process. Mohs micrographic surgery is a highly specialized technique used to completely remove skin cancers with the highest cure rates. It was developed by Dr. Frederic Mohs in the 1930s and has been modernized over time. 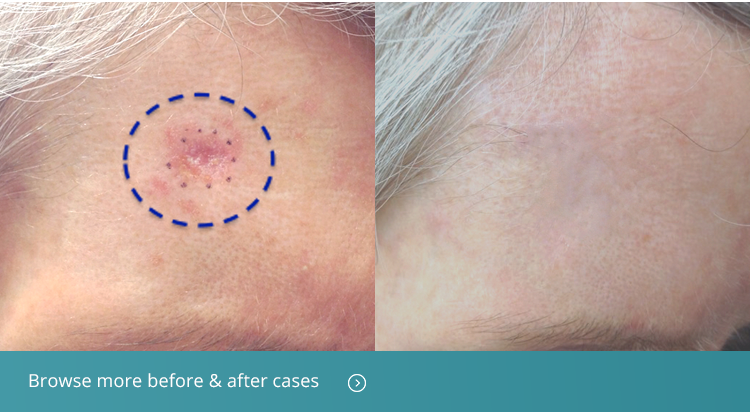 Through direct microscopic examination and specialized marking techniques, Mohs surgery removes only cancerous areas, and preserves as much healthy skin as possible. This minimizes scarring and is especially useful when treating skin cancers on the face, neck, ears, and hands. What are the steps of Mohs surgery? The first step of Mohs surgery is identifying your biopsy site. Even if the skin appears to have healed over this spot, cancer roots that remain invisible to the naked eye may extend below the skin’s surface. If the cancer is not treated, it will continue to grow and may require a much larger surgery when it later resurfaces. The confirmed biopsy site is then numbed with local anesthesia (lidocaine). After an initial pinch and sting, your nerves will go to sleep and you should no longer feel discomfort. A small pancake of skin will be removed around the biopsy site. It will be marked, precisely colored, and taken to our lab for processing. A temporary bandage will be placed over your wound, and you will be escorted to the waiting room where you may rest, snack, read, or use your mobile device or laptop. Lab processing requires at least one hour, so please be prepared for this wait time. Once the skin has been processed by the lab, your doctor will examine it closely under the microscope. He or she will examine 100% of the base and edges of the skin piece to determine if any cancer roots remain. If a root is identified, you will be taken back to your treatment room for a second “layer.” If no roots are identified, you will begin discussing reconstruction options (Step 7). Additional numbing medicine will be added to the treatment area, and a small piece of skin corresponding only to the localized cancer root will be removed. It will be marked, precisely colored, and taken to our lab for processing. You will be re-bandaged and escorted back to the waiting room for another approximate one hour wait. Once the skin has been processed, your doctor will closely examine this second skin layer under the microscope and identify if any cancer roots remain. If a root is identified, you will repeat the process of having another skin layer taken, followed by waiting for processing and analysis. Sometimes cancers are removed in one layer, but occasionally, a cancer may extend much further than anticipated. Because of this, we ask you to keep your schedule free for the entire day. When all of your skin cancer has been removed, your doctor will discuss reconstruction options with you, which will vary, depending on the location and size of your surgical wound. Sometimes wounds are left to heal by nature. Sometimes they are stitched directly. Occasionally, adjacent skin is pulled over the wound using a skin flap, or skin is borrowed from a more distant body location to be used as a skin graft. Your doctor will explain advantages and disadvantages of these options and together, you will determine the best option for your wound. Once reconstruction is complete, you will be bandaged and given detailed instructions on how to best care for your surgery site. You will be asked to return in 1-2 weeks to make sure the healing process is going well.